On 24 June 1914, the founding of Naval Aviation School was approved by Navy Ministry. 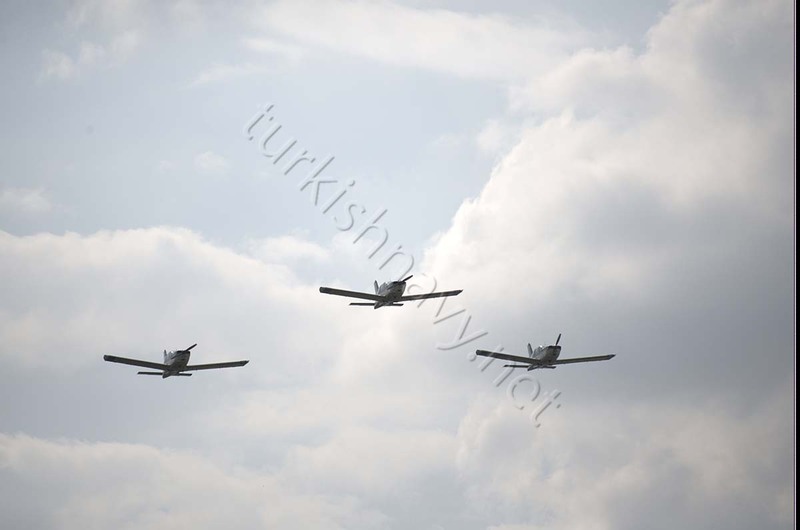 Its location was just alongside to the Aviation School in Yeşilköy. There was an additional hangar for seaplanes at the coast a few kilometers south. Today Yeşiköy Atatürk International Airport occupies the land that used to be the school and its runway and Airforce Academy is built on the grounds that used to house the hangar for the seaplanes. 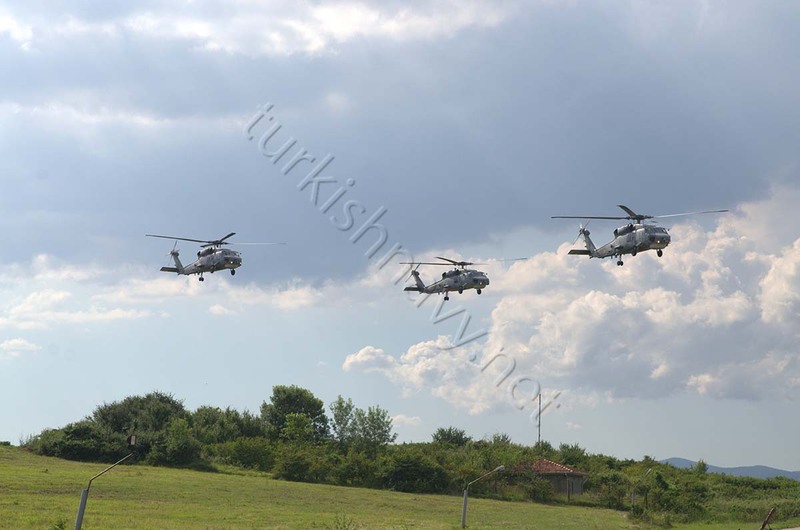 To commemorate the 104. anniversary of Turkish Naval Aviation, I share photos I took today 4 years ago. 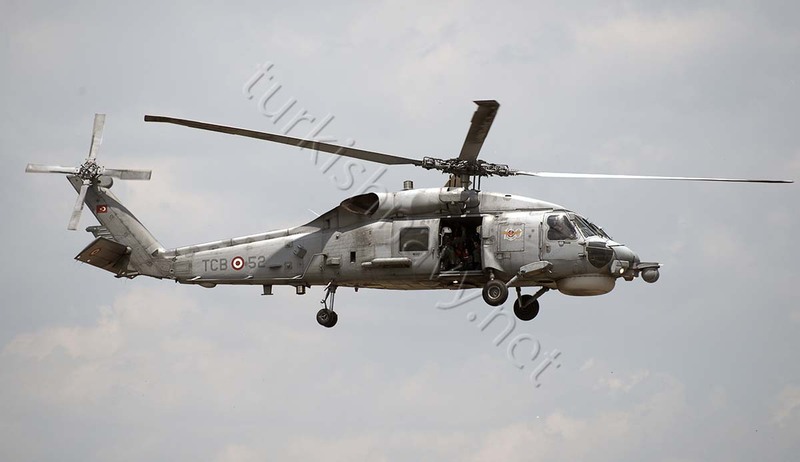 TCB44, an AB-212 ASW helicopter. These old birds are getting retired as they finish the service lives. TCB52, an S-70B Seahawk helicopter. 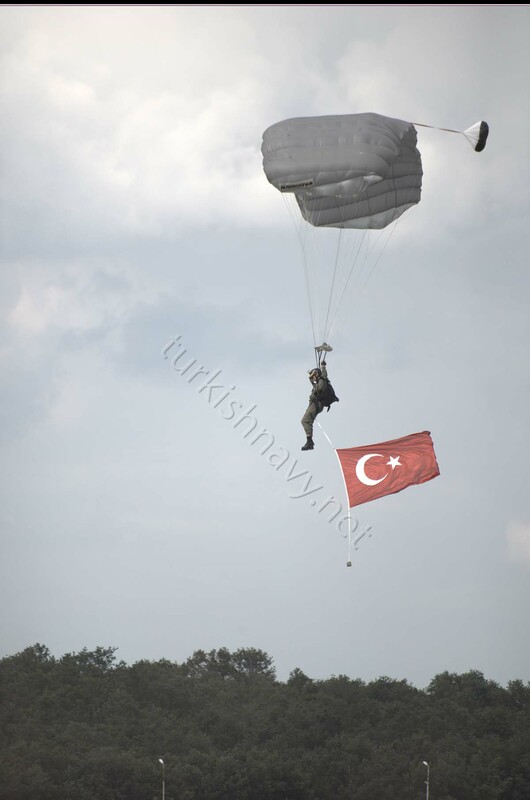 The workhorse of Turkish Naval Aviation. TCB-652, a P-235 maritime patrol / ASW plane. It took ages to complete the maritime mission systems and sensor and even longer to integrate them to the existing CN-235 chassis. Now they are working around the clock. 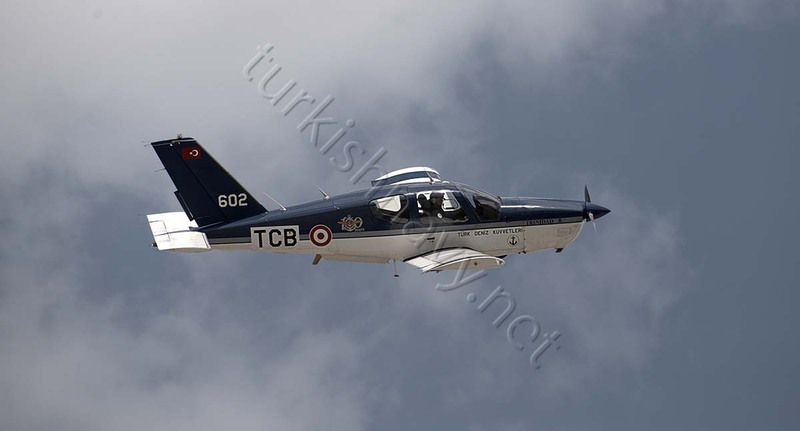 TCB-701, P-72 utility airplane for Turkish Navy. In 2008 Turkey ordered 10 ATR 72-500 ASW from Italy. 6 years later the order was amended to 2 ATR-72 600 TMUA and 6 ATR-72 600 TMPA planes. 10 years later we are still waiting patiently for ASW the planes. All we got in the meantime are two unarmed ATR-72-600 planes for utility missions. 3 P-235 ASW planes in formation flight. 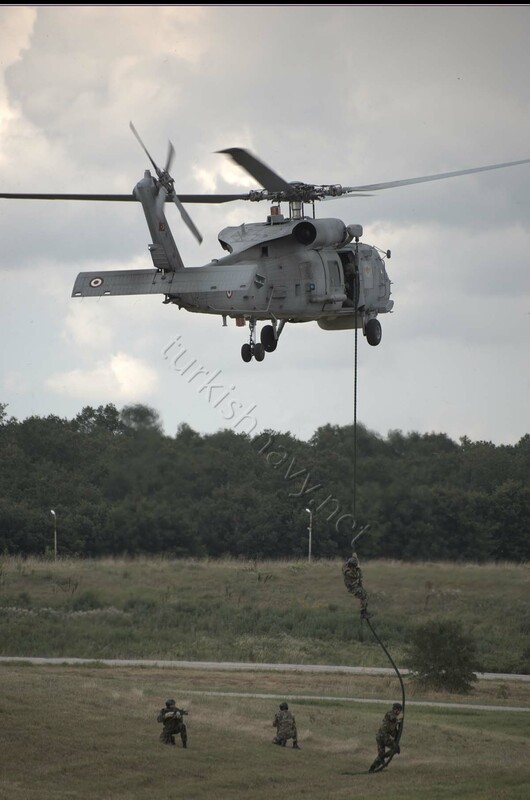 A four-man team of Turkish naval special forces fast-roping from a hovering SH-70 Seahawk. 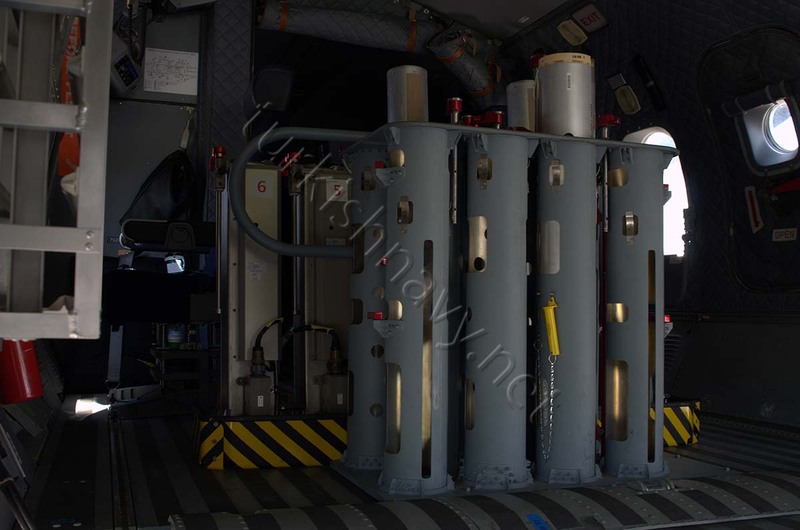 Sonobuoy launchers on a P-235 ASW plane. A Penguin anti-ship missile training round. A P-235 ASW plane and her crew. 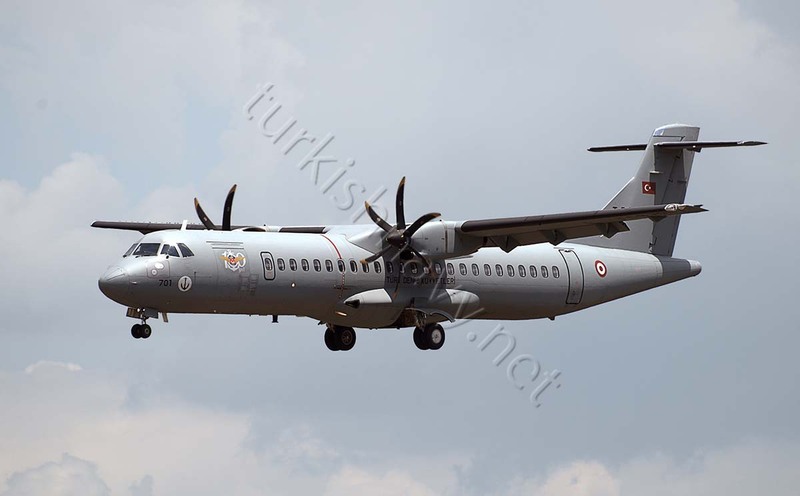 The first ATR-72 600 ASW plane of Turkish Navy in test flight. Photo: Lidie Berendsen. It is a joy to see one ATR-72 60 ASW plane in the air at last. It has been 11 years since the contract was signed. The saga of the procurement of these planes is longer than the range of the real plane. At the IDEF defense show in Istanbul in 2013, Alenia Aermacchi and Turkish Aerospace Industries (TAI) signed a memorandum of understanding to offer the ATR-72 as a maritime patrol aircraft, with the Italian company supplying the basic airframe and carrying out the final integration and test work, while TAI made modifications to the aircraft and installed mission equipment. 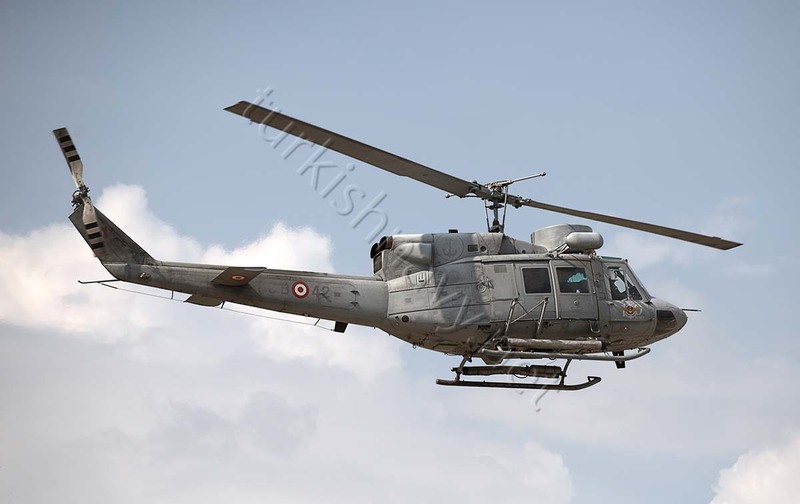 To be known as Meltam-IIIs, they will be operated by the Turkish Navy and the first of six ordered will shortly be transferred to Turin, Italy, after fitting out by TAI in Turkey. The aircraft are fitted with the ThalesAirborne Maritime Situation & Control System (AMASCOS) mission system and should be delivered back to Turkey in 2017. 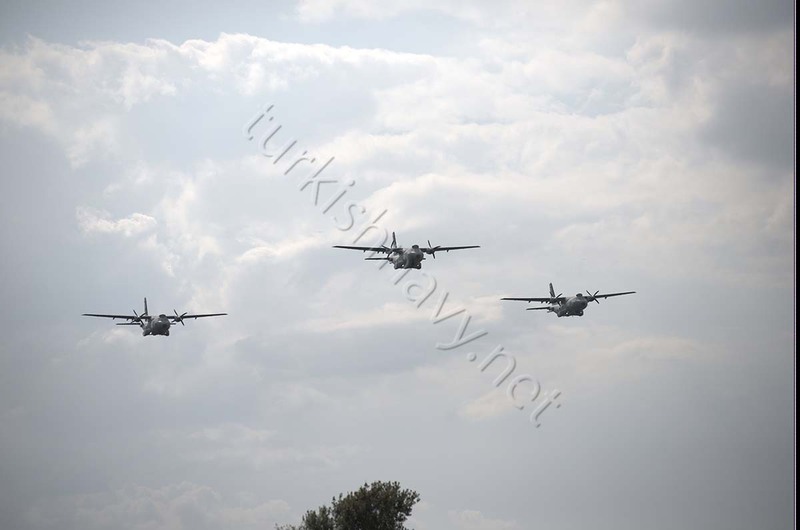 Two more ATR-72s have already been supplied to Turkey for utility missions. IF (yes that is a big if) the planes are delivered as scheduled in 2017 that will make 12 years from the signing of the original contact to the delivery. 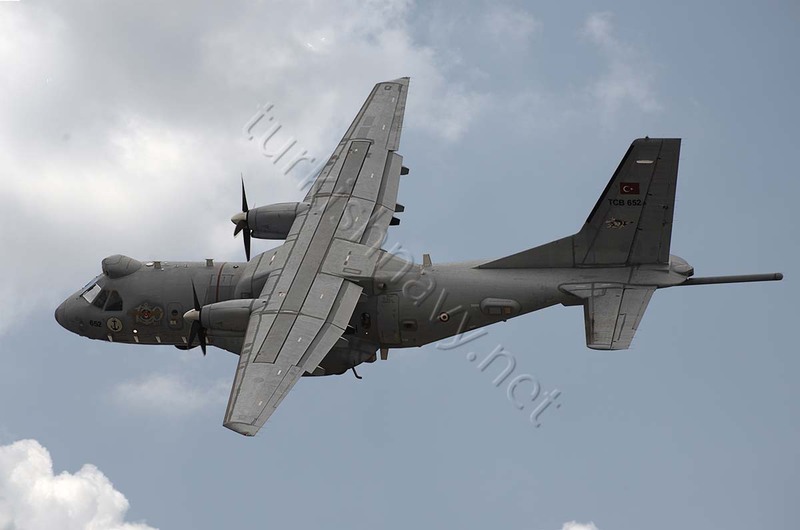 In July 2005 Italian Prime Minister Mr. Belosconi and his Turkish counterpart Mr. Erdoğan signed a deal on acquisition of 10 maritime patrol planes based on Alenia’s ATR-72 500 turboprop aircraft. According to the $219-million contract the initial deliveries were supposed to be in 2010. The first ATR-72 500 arrived in Turkish Aerospace Industries in February 2008. TAI worked as Alenia’s local sub-contractor, carrying out all modifications from the base airframe to the ATR-72 MPA configuration. In May 2013 suddenly there was a big change in the project. The project was downsized from 10 planes to 8: 2 utility models for personnel and cargo, and 6 armed maritime patrol models. The good part of this rearrangement was the model of the planes were upgraded, from ATR-72 500 which, was no longer in production, to ATR-72 600.
delivered to TAI in 2008, and was remodeled to ATR-72 600 in due time. In August 2013 the first base ATR-72 600 was delivered to TAI for the changes to MPA configuration. According to the above quoted article this plane will shortly be transferred back to Alenia for final modification. These planes will be armed with Mk-46 and Mk-54 lightweight torpedoes and will carry Thales AMASCOS maritime patrol mission system. 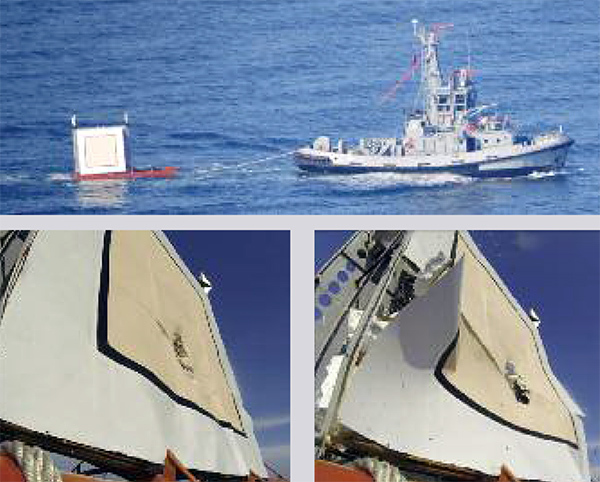 AMASCOS integrates an array of sensors that include a surveillance turret, Thales’ Ocean Master search radar, an ESM radar/transmitter locator, a Magnetic Anomaly Detector to find submarines, and transmissions from launched sonobuoys. 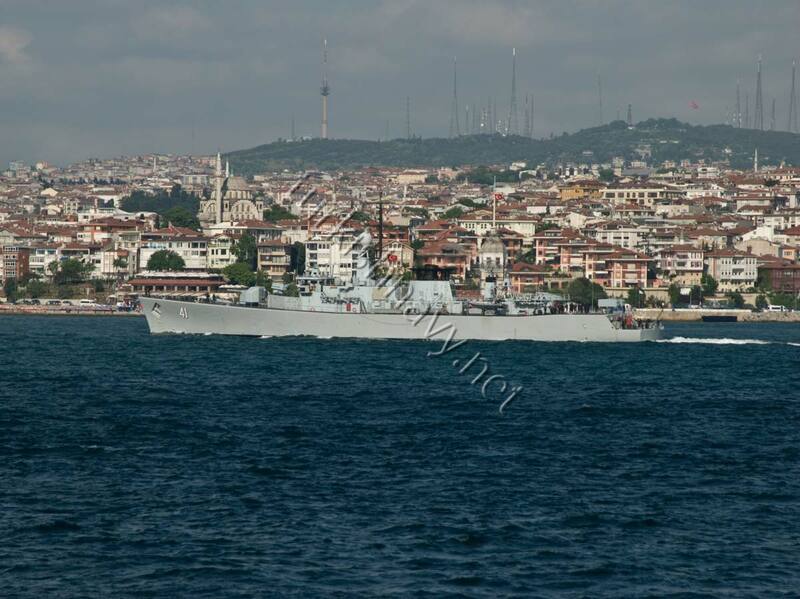 Hopefully the plane will be in Turkish Navy service by 2017. In the mean time Turkish Navy is considering procurement of new maritime patrol planes with even longer ranges. 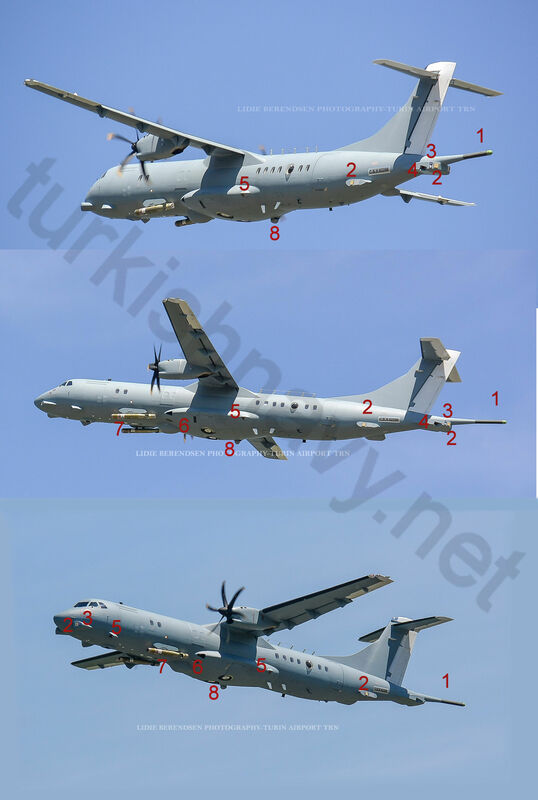 New Maritime Patrol Planes For Turkish Navy? A contract was signed on 2008 to buy 10 ATR 72-500 ASW from Italy. 8 years later we are still waiting patiently for the planes. All we got in the mean time are two unarmed ATR-72-600 planes for utility missions. 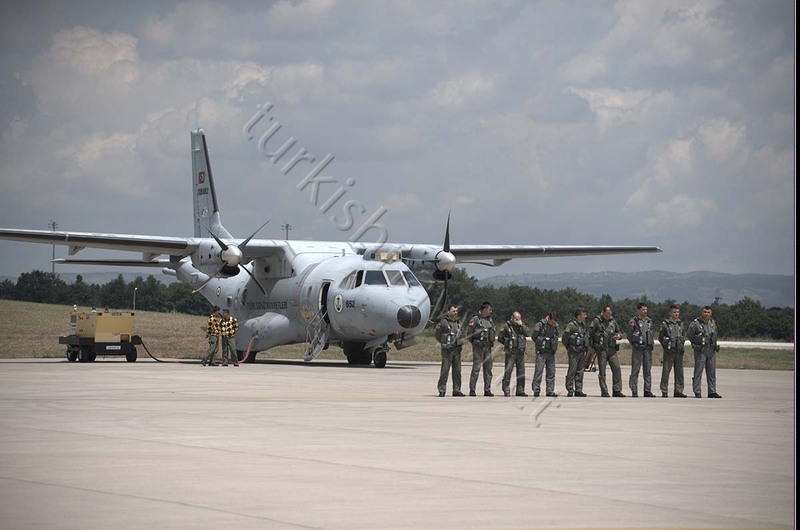 6 of these C-235 ASW planes are the backbone of Turkish airborne ASWand AsuW missions. 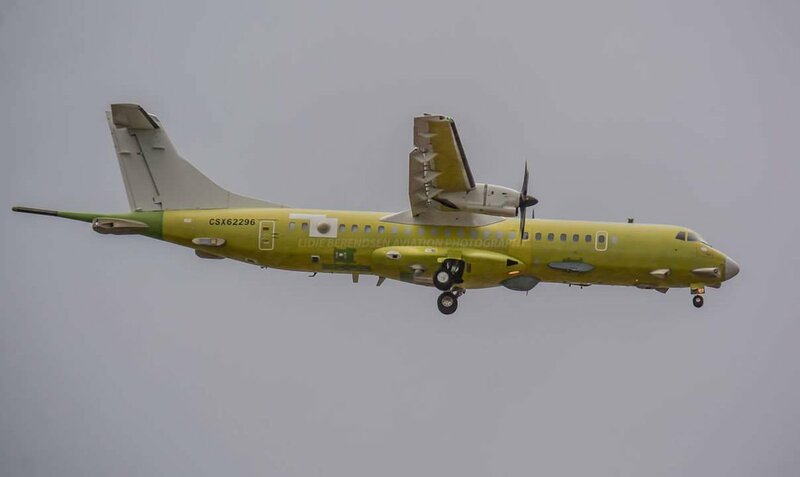 When the acquisition project of these planes started in 1998, CASA was still an independent company, the C-295 has just made its maiden flight and its ASW version did not exist even in the dreams of the CASA/EADS/Airbus Military engineers. P-8A Poseidon was not even on the drawing board. 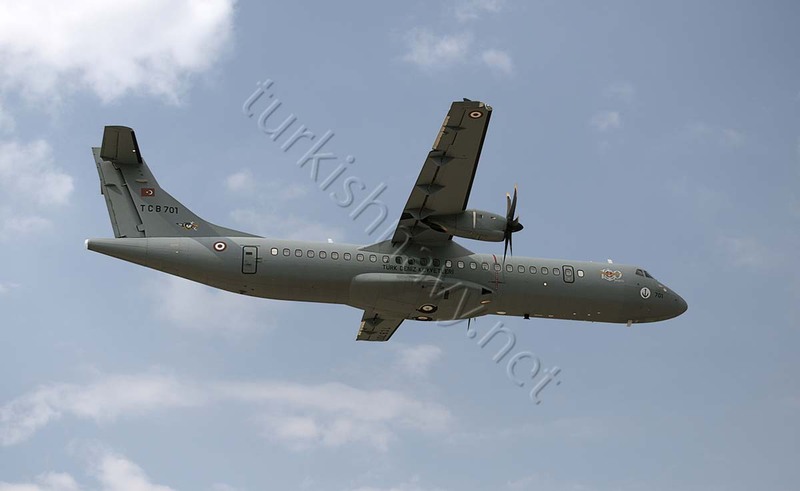 ANKARA, Turkey — The Turkish Navy is considering the purchase of long-range patrol aircraft to add to its fleet of CN-235 and ATR72s, navy and procurement officials said. “The requirement comes in line with the government’s foreign policy priorities,” explained one procurement official. Navy officials say the planned aircraft should be able to fly 1,000 to 1,200 nautical miles away from their main base in Turkey and fly 12 to 15 hours. Naval industry sources say the Turkish description of the requirement would probably point to the Boeing P-8 Poseidon (formerly the Multimission Maritime Aircraft or MMA). The P-8 Poseidon was developed for the US Navy by Boeing Defense, Space & Security, modified from the 737-800ERX. The P-8 also conducts shipping interdiction, along with an electronic signals intelligence role which involves carrying torpedoes, depth charges, SLAM-ER missiles, Harpoon anti-ship missiles, and other weapons. It is able to drop and monitor sonobuoys. The aircraft is designed to operate in conjunction with the Northrop Grumman MQ-4C Triton Broad Area Maritime Surveillance unmanned aerial vehicle. Procurement officials say they hope to issue a request for information for the planned acquisition soon. “We are hoping to see a competitive contest,” one official said. But industry sources say the description of the acquisition narrows options. “There will not be too many bidders, judging from the description of the requirement,” said one source. The technical requirement describes a plane that is able to fly 1,000 to 1,200 nautical miles away from their main base in Turkey and fly 12 to 15 hours. As far as I know there is only two planes exist that can fill this expectations. Boeing’s P-8A Poseidon and Ilyushin’s Il-38. I have no idea who the unnamed procurement official was, but I am glad that I am not in his/her shoes. It will be very hard to create an illusion of competitive contest with one contestant. Australia paid for 8 P-8A planes USD2.88 billion and India paid for 8 P-8I Neptune (Indian designation) planes USD2.1 billion. If this procurement project goes ahead it will be most expensive acquisitions for Turkish Naval Aviation. There are better places where we can wisely spend a couple billion US Dollars such as the air defence ship project TF-2000. I will be most surprised if this announced interest in P-8A Poseidon planes materializes into a contract very soon. The acquisitions projects for maritime patrol and ASW planes are beleaguered with massive delays. Above: TCG Ödev tows the target. Below: the point of impact and the damage to the target. The firing of the missile. 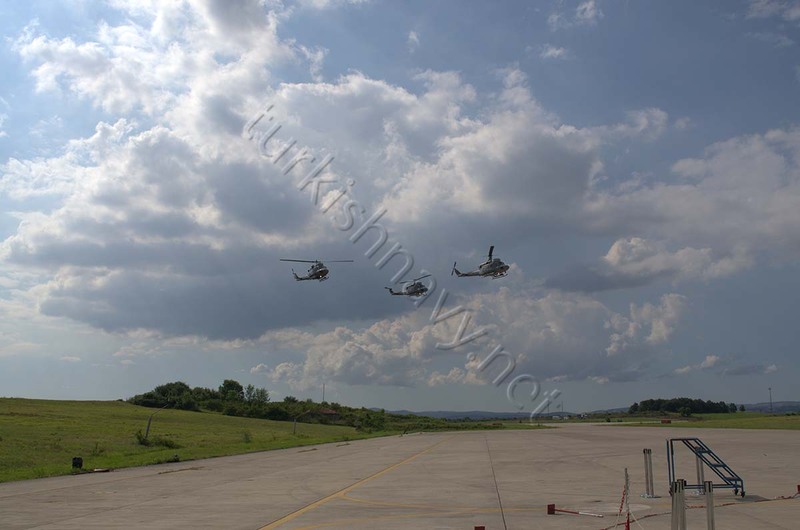 The test bed: Turkish S-70 B2 helicopter with the tail number TCB-66. 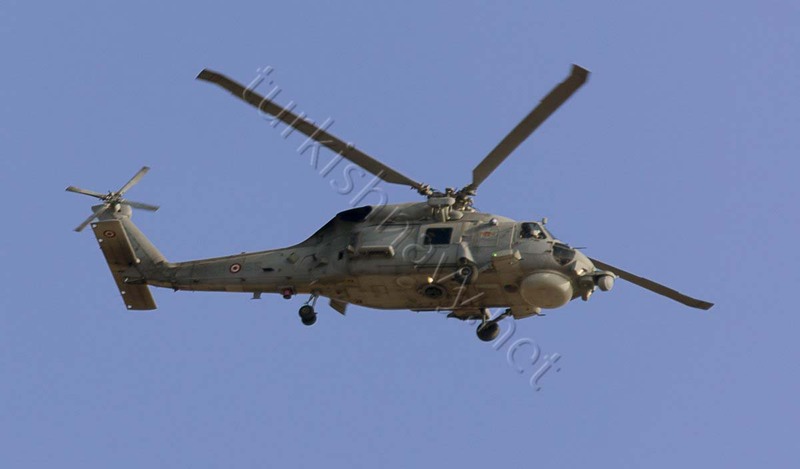 Last week I had reported about the this photo of a Turkish S-70 B2 Sea Hawk helicopter firing a missile. Thanks to the comment of my reader Frankie I have now more information strait from the in house magazine of Roketsan. According to the magazine the test was conducted on 16 September 2014, from the helicopter TCB-66 which was modified for this test. The modifications included a firing control panel inside the cockpit, the special designed power and data cabling for the communication between the missile and the helicopter and finally a missile launcher that fits to the helicopter. The missile it self is a laser guided UMTAS. It is a beam rider that means the missile follows a the reflection of a laser beam pointed to the target. The source of this beam can the the launching aircraft, a ground based forward observer or another aircraft. The missile has be locked-on before the launch or lock-on after the launch modes. During the test the launching platform (TCB-66) was the laser designator. 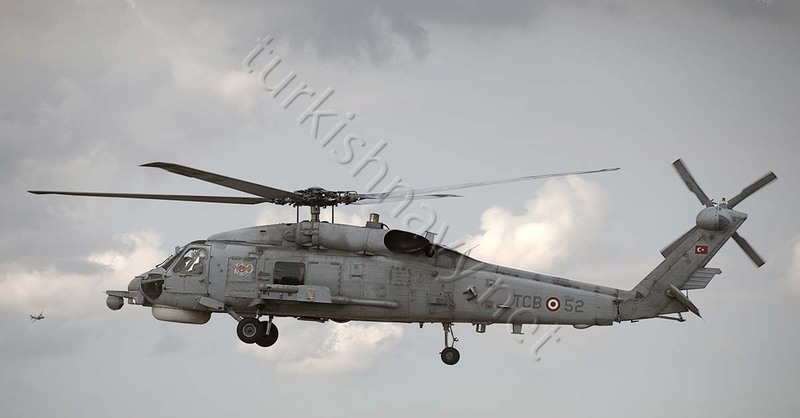 The height of the helicopter was 200 meters over the sea level and the target was 4000 meters away, towed the Turkish Navy tug TCG Ödev. Roketsan states the maximum range of the L-UMTAS as 8000 meters. 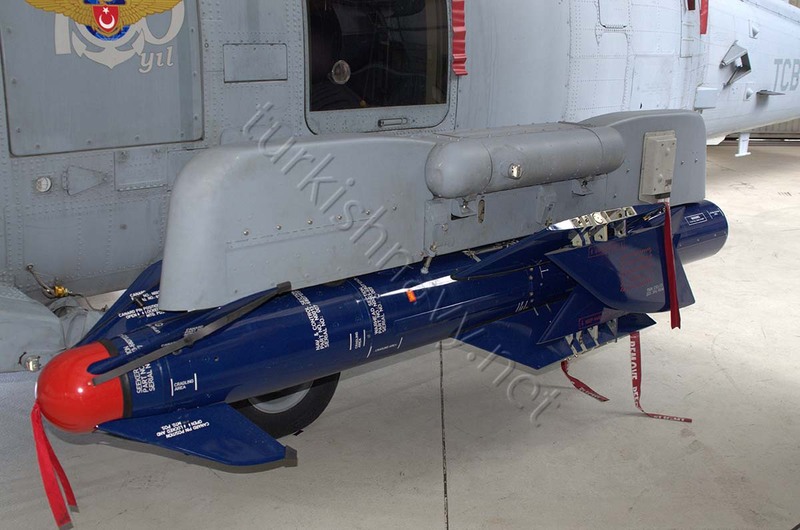 Turkish Navy is the only operator of the Hellfire missile family in Turkey. 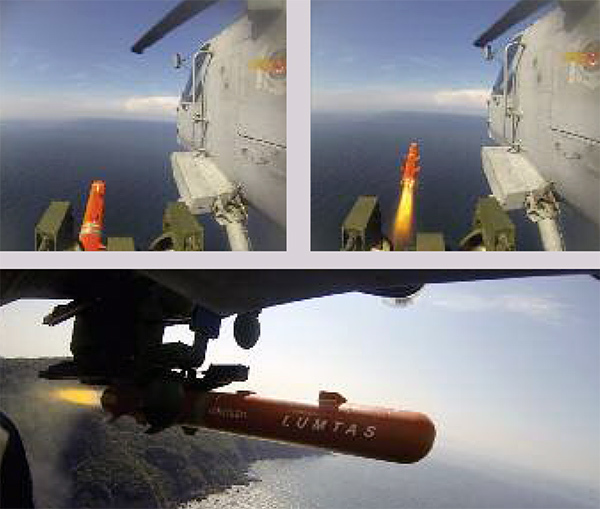 As is the missile is very similar in performance to the Hellfire missiles used by Turkish Navy thus L-UMTAS offers a local replacement for the Hellfire missiles. 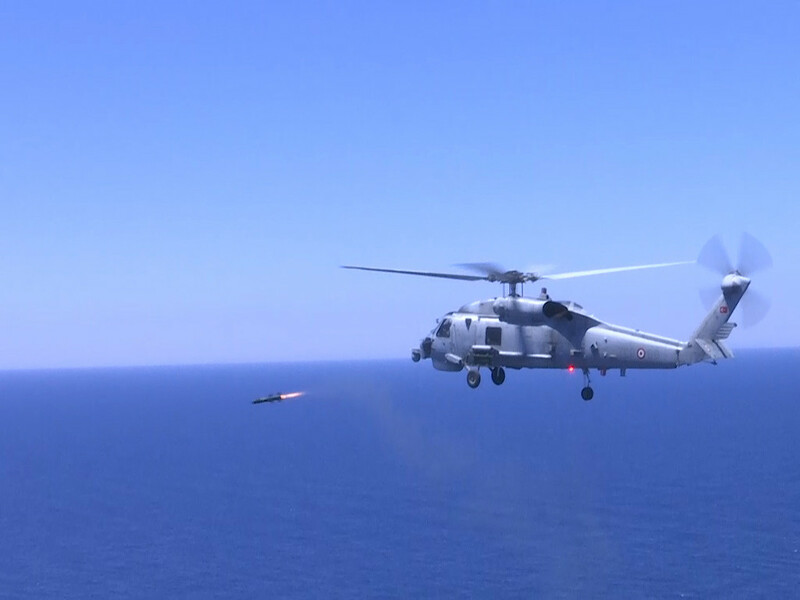 This is a photo of a Turkish S-72B Sea Hawk helicopter firing a missile. There are many things, one can say about this photo. 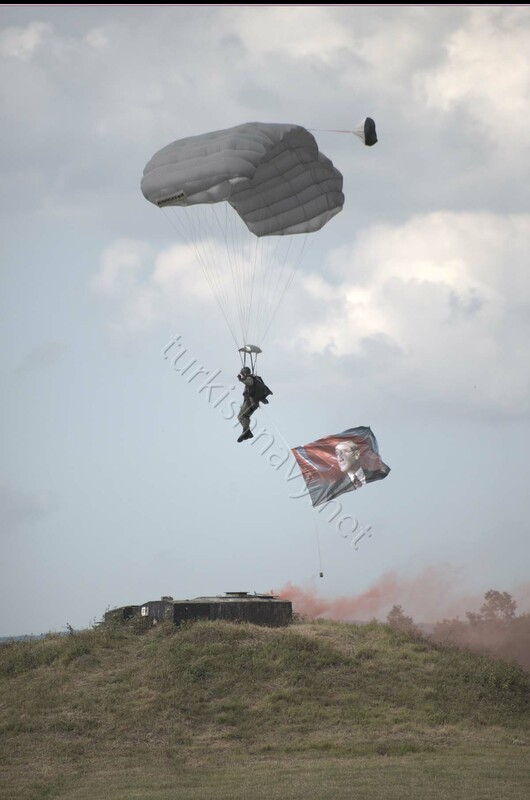 The special 100th Anniversary Logo of the Turkish Naval Aviation is painted on the side of the fuselage dates the photo to 2014. 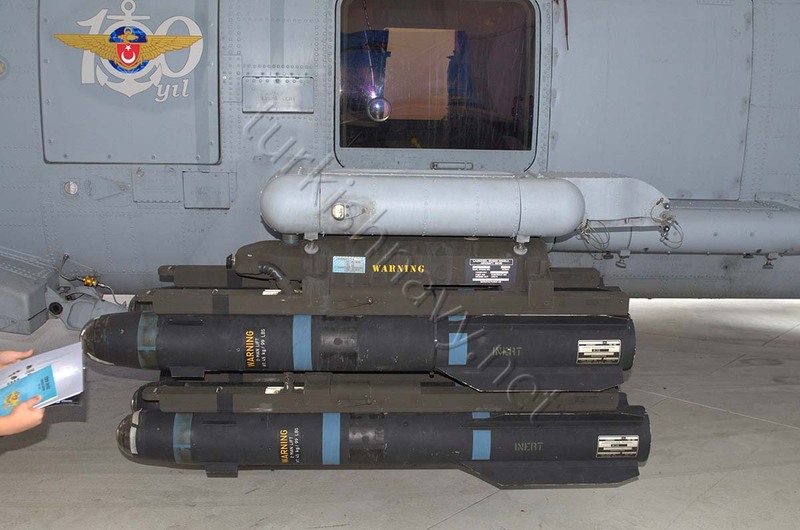 The usual missile armament of Turkish Navy helicopter are Penguin Mk2 and AGM-114K Hellfire II missiles. The bright red color of the missile indicates that it is not a serial production unit. 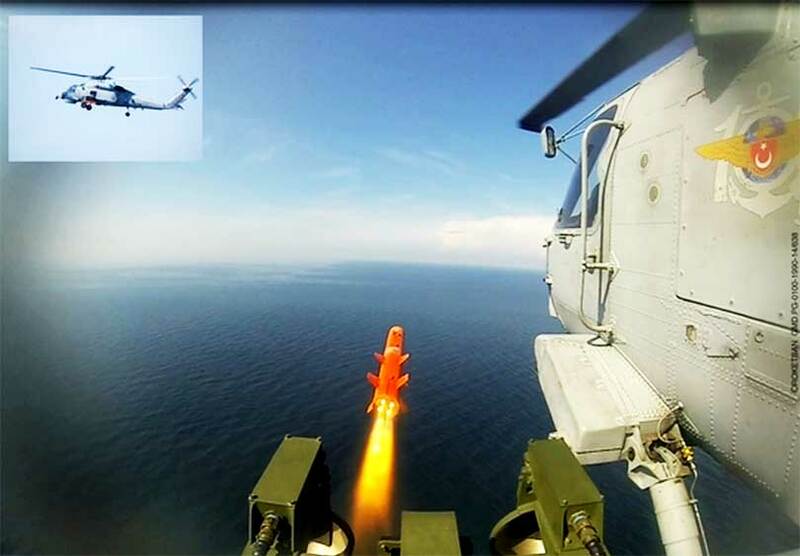 Thus this must be a photo of a test firing of a missile in development for Turkish Navy helicopters. 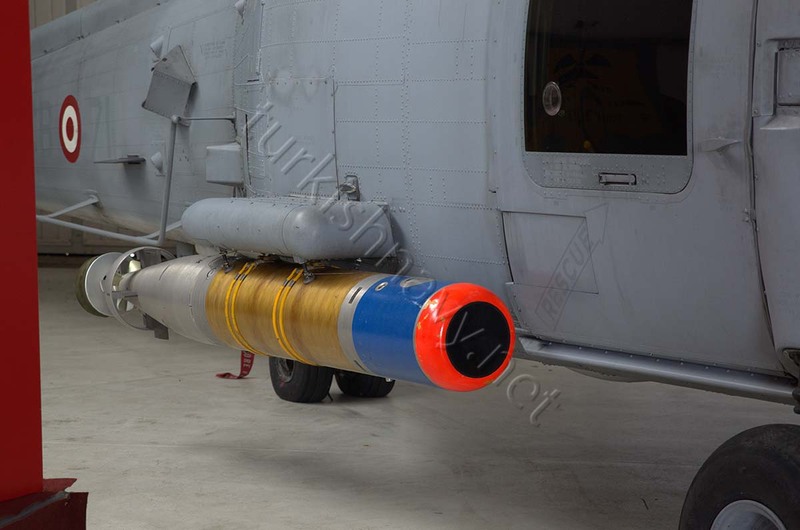 There are some speculative information on Turkish websites that this missile might the a naval version of the Mızrak long-range anti tank missile developed by Roketsan. If this photo turns out indeed to be a test firing of a navalized version of Mızrak, then the missile may have an Imaging Infra-Red (IIR) seeker and a range longer than 15 km. These features will enable to helicopter to stay out of the range of SAM missiles her target may be carrying.